On the Day of Pentecost, June 2, 1963, Paul Tillich stood in the midst of a gathering in New Harmony and spoke: "I, Paul Tillich, give my name to this place, and dedicate the ground of this park...to a new reality, conquering what is estranged and reuniting what belongs to each other, in the power of the Spiritual Presence." Earlier in the day, Tillich had addressed the gathering on the subject, "Estranged and Reunited: The New Being," in the Roofless Church, directly across North Main Street from Paul Tillich Park. 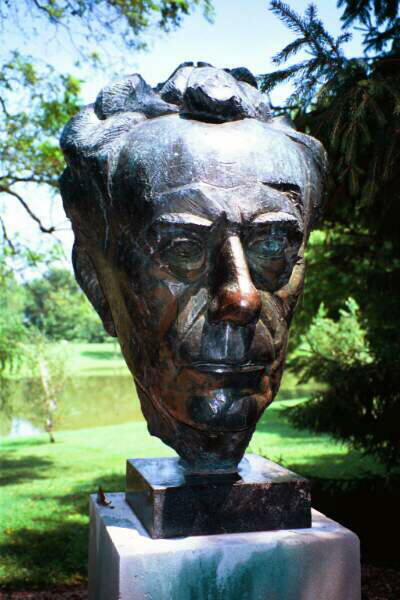 Tillich died in 1965, and his ashes were interred in the park. Those who walk the park today may ponder quotations from Tillich's writings inscribed on large rocks along the pathway. The words Man and nature belong together in their created glory - in their tragedy and in their salvation are especially appropriate: Man representing the communitarians of New Harmony - that is, the Harmonists and the Owenites - nature representing the naturalists at New Harmony who uncovered life-secrets and earth-secrets of creation. The word tragedy tells much of New Harmony history, as of all human history, and salvation crowns the human experience as a promise consistent with Harmonist faith and Tillich's mission. Tillich was born in Starzeddel, Germany, in 1886. From 1904 to 1909 he studied at universities in Berlin, Tübingen, and Halle, and in 1910 he received the Ph. D. degree from the University of Breslau. He was ordained in the Evangelical Church of the Prussian Union, Berlin, in 1912, and served as an army chaplain on the Western front during World War 1. From 1919-24, Tillich was a Privatdozent at the University of Berlin, from 1924-25 Associate Professor of Theology at the University of Marburg, from 1925-29 Professor of Philosophy and Religious Studies at the Dresden Institute of Technology, and from 1929-33, Professor of Philosophy at the University of Frankfurt. On April 13, 1933 Tillich's position was suspended by the Nazi government, and on November 3, he arrived in New York, where, until 1937, he was Visiting Professor of Philosophy of Religion and Systematic Theology at Union Theological Seminary; at Union, he served as Associate Professor of Philosophical Theology (1937-40) and Professor (1937-55). From 1955-62, he was University Professor at Harvard, and during his last three years, the Nuveen Professor Theology in the Divinity School, University of Chicago. Wilhelm and Marion Pauck, Paul Tillich: His Life & Thought; Volume I: Life, Harper & Row, New York, 1976.